3.3 "Quite a Common Fairy"
Tonight the band of misfits continues wandering through the wilds of Neverland watching Peter Pan move his camp from under their noses. Hook suggests finding Tinker Bell, Regina, of course, has ticked her off, and Pixie Dust is apparently the panacea of the magic world. 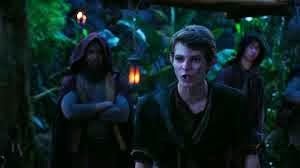 Meanwhile Pan tries to convince Henry that it wasn't Emma, but instead her son who is the savior, and Neal uses Robin Hood's son as bait. 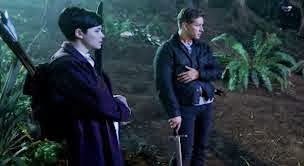 In the flashbacks we find out why Tinker Bell hates Regina, but Snow and Emma patch everything up in about 2 seconds. I did like Tinker Bell. I loved the costuming and the wing effect. But crazy Tinker Bell reminded me of a certain blonde in the final season of Lost. I was kind of waiting for them to stumble across some sort of dead squirrel baby or something. (this is kind of a private joke, but I couldn't resist including it, so I apologize if you have no idea what I'm talking about). When Tinker Bell said, "I'm a fairy. You might want to try believing in me," I just wanted to shout at Regina "CLAP CLAP!" Of course, the episode was all about belief - belief in others and belief in yourself, something almost all of our characters are lacking. Regina doesn't believe in herself, in love, or in much of anything. You could argue that she believes in Henry, but I disagree since she continually does the exact opposite of what he asks her to do. Emma doesn't really believe that she's the savior, and after this episode we all have to wonder if she hasn't been right all along. Tinker Bell doesn't believe in much anymore either, but she has managed to hold onto a little bit of hope, if she's willing to offer a little help to the band of misfits. However, that is presupposing she isn't setting them up or trying to hurt Regina again. Henry doesn't believe he's the savior, though he's obviously shaken by the drawing Pan gives him. And David doesn't believe that he can entrust his injury to the others. I know he is trying to protect them, but have we not been through this enough times already? Please. 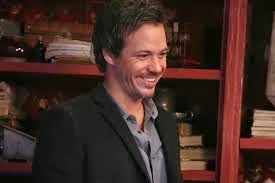 Neal doesn't believe in love either, since he's not sure if he'll be able to work things out with Emma and Henry. It's a whole big mess! Regina is such a liar. Like always. And always blaming other people for her own problems. But I still don't see how Regina ruined Tinker Bell's life. Would the blue fairy have been any less apt to punish Tinker Bell if Regina had left her husband and met her "true love"? However, as always, happiness=weakness to Regina. It was a nice touch to make her heart all dark and hard. Was anyone else wondering if Regina managed to give Tinker Bell the means to hurt her really badly now?I'm rather scared for Henry. And how does Tinker Bell end up in Neverland? I'm hoping it has something to do with Hook and that we get that story soon. I loved that Hook was the only one who knew what had happened with David. He's so much more perceptive than people give him credit for and I need another Hook-centric episode soon! Mini Robin Hood was pretty much the cutest thing ever and I was so glad nothing happened to him. "It's kind of a family thing." And you've gotta give Henry props for trying to shoot Pan. It does make sense to believe that Henry is the savior of magic, though. He's the one who has always believed in it no matter what. And Peter Pan is so well cast it almost hurts. I love the creepiness he exudes, but at the same time there are these tiny little hints that he's just trying to save everything. So I don't know. But I love the character! I do like that Neal's speech pattern is so much more modern than the other characters. Emma and Neal are much more casual with more slang, conflated words, and contractions. There's a softness in their speech as opposed to all of the fairy tale characters who are very precise and crisp. So there's my mixed bag thoughts on the episode. What did you think? What are you looking forward to? I can't wait for Neal to be reunited with his family! And it looks like we get back to Rumple next week as well.